Like last year, we decided to continue the tradition of making charitable donations instead of buying more stuff. Thankfully our closest family members agree to play along. There is nothing more satisfying than putting some money toward something so meaningful. And it's really fun to shop around. We pooled our close-to-home family member into two groups. That way, we thought, we would be able to buy some bigger ticket items and choose items that suited each group better. The only downside is that we only got one card per purchase to give to the recipients so we weren't able to use them really. 1. 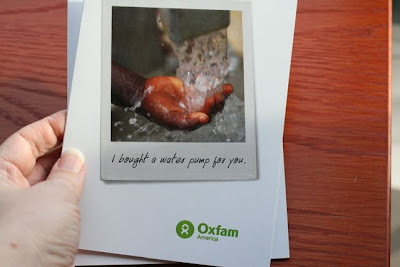 First, through OXFAM, we bought a WATER PUMP and BOOKS FOR KIDS. This is what they say: "A manual water pump allows people to access fresh drinking water in their own communities, rather than having to walk for miles to access it. This simple pump alone can save an entire village from hours of labor and keep people healthy" and "Children's books on a wide range of practical topics from agriculture to peace-building. By helping someone open a book, you can open a mind, too." These two gifts seemed best suited to Spud's Nana and great aunt. 2. Second, we paid for IMMUNIZING A COMMUNITY IN BOLIVIA PLAN CANADA. This is their blurb: "Immunizing a Community in Bolivia = A good start to a long life for children. One in 15 children will die from preventable illnesses before the age of five due to lack of access to routine immunizations. This gift supports community immunization campaigns targeting typhoid, polio, measles and diphtheria across communities in Bolivia." This gift seemed best suited for Spud's Grandad, Grandee and two aunties.